Over the years ACL has invested heavily in their product portfolio, developing capabilities far beyond their Desktop tool. These have included multi-user collaboration, centralised multicore processing, scheduling and workflow management to name but a few. But for a long time the one critical component missing from their suite has been high specification Data Visualisation. In partnership with Yellowfin business intelligence, ACL’s latest offering AX Dashboard, bridges the visualisation gap with a phenomenal array of graphing and drill down capabilities. The tool sets a new standard for reporting. Whether it’s continuous auditing, boardroom reporting or continuous business monitoring, the range of visual representations available to the end-user is unparalleled. Visualising analytic results into meaningful, easy-to-digest views for management and key stakeholders is traditionally challenging and time-consuming. AX Dashboard does the heavy lifting for you, transforming rows and columns into visually impactful representations. The results from either AX Exception or an analytic-enabled audit are clear, concise and meaningful. The pricing model is simple. There is no upfront product cost. There is a small per licence fee (per user per year + VAT + Support). There may be a few days assist to install and, if you need it, time to configure and develop your reporting requirements. But there is nothing to prevent you from doing this yourself. 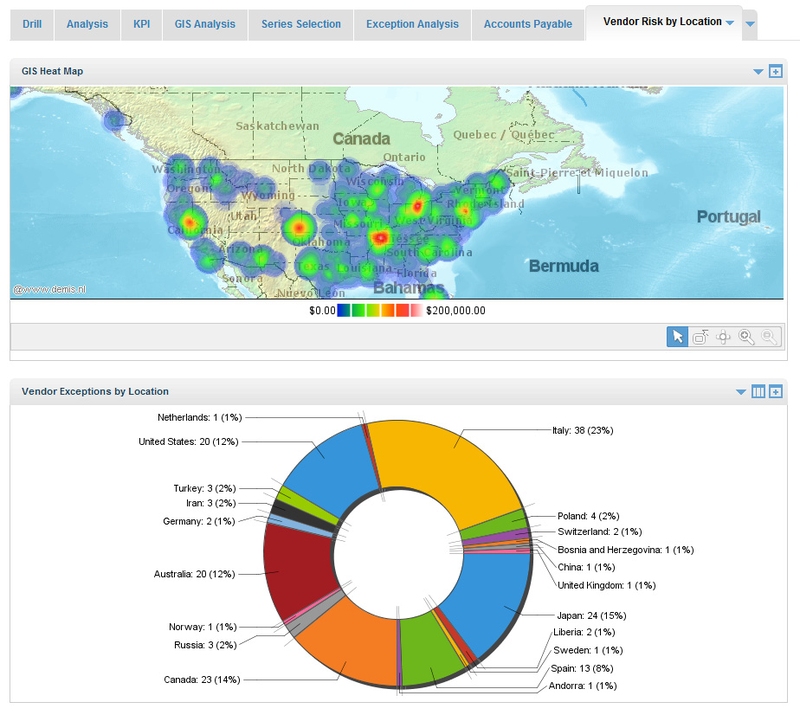 AX Dashboard is a web-based platform equipped with enterprise-level security so you can decide who sees what information. Security can be specified so sensitive information is protected. AX Dashboard allows the visualisation of data in 40 different chart types, from sophisticated heat maps to line charts, with easy transformations. The tool allows reporting from a number of sources that include but is not limited to SQL, Excel and text reports. Use alerts to inform management when critical thresholds have been reached, allowing timely action to be taken. Furthermore, reports can be pushed automatically through email, including graphics, to keep everyone up to date with the latest information. Forget static views. Increase the value of reports using interactive features that provide context through Drill-Downs, Time- Sliders, Tooltips and Series Selection – presenting findings in new and novel ways. Allow the board to Monitor Key Risk and Performance Indicators through summaries or trending. AX Dashboard ensures everyone is kept in the loop, providing meaningful context at a glance, whilst decreasing the time taken to act on key areas of risk.